Did you see Cam and Peyton blister the field in Super Bowl 50 with their brand of high octane offense? Of course not. Because that’s not what happened, despite what the sports journalists predicted in the crushing hype leading up to the game. I wonder why nobody takes into consideration that other people are on the field giving their all too? It’s their job to stop them. From a former defensive tackle (I was the slow guy that tried hard in high school), I thought it was a great performance. It certainly wasn’t what the talking heads predicted. So around the world Denver Broncos fans are celebrating, Carolina Panther fans are saying “wait until next year” in the surrender cobra pose, and everyone else is just either talking about how dumb the halftime show was or the disappointment in the commercials this year. My eleven year old son is trying to weasel out of doing the dishes three times in one week, as he lost his bet by backing Cam. This old guy took the old guy. Before we begin – please take a look at this. 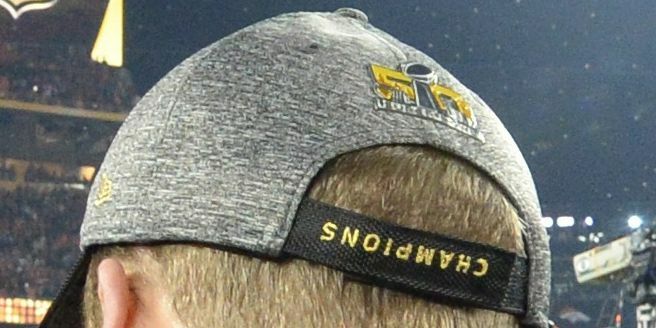 I don’t care who you are, you have to make sure when you hand the star player for the winning team a championship hat, that it is produced correctly. Of course that hat is probably worth a gazillion dollars by now. I wouldn’t be surprised if there are knock-off versions either. Ok, here we go… Where is the best place to start? Probably your work order. This document needs to convey exactly what everyone in the building needs to work on in their departments. Take a minute and examine how this is created, and what information is on this form. Is everything there and easy to understand? If you feel you have to hand write notes on it or highlight certain parts, then possibly there is something missing in your training with the rest of your team and it isn’t up to standard. Are you including a color copy of the art with a mock up of the decoration on the shirt that is being used? Do you show key landmarks and dimensions so production knows exactly what to use for placement on the garment? This document is like the blueprint for a building. Make sure it’s complete and correct. The next stop has to be in your Receiving department. They are on the front line of defense for your shop. After all, that’s not a box of shirts that the UPS guy just delivered; it’s a box of money. If you receive something that wasn’t ordered, or maybe the size or the color is wrong…you could be in big trouble. Worse, maybe a few pieces of mediums are missing. Always triple check against the order in the system, the packing list in the box, and the contents of the box itself. Everything should match. You should be counting the shirts, and not just waving your magic wand over the case and pretending they are all there. Shirt manufacturers box up the wrong stuff. Shirt distributors get it wrong too. A good receiving team has to assume that something is wrong with everything they come across…they just have to find the mistake. What’s the worst time to find out that something isn’t right? After it’s been produced. Put some effort into the beginning of the order. It’s worth it. Is there total company dedication to getting things right? When things go south, do departments blame one another instead of looking inward at how to prevent the problem from occurring again? I saw this great locker room sign that said, “Losers blame the coach and other players. Winners pull together as a team and work harder.” Which sentence would apply to your company team? How much time is lost during the day breaking down the old job and getting prepped up for the next one? Do you make things easy for the crews by bringing them everything they need? Do people stand around watching the press operator set up, or is there an organized ballet of work with the press crew changing things over? Minimizing downtime is critical for keeping your schedule on track. I know I’m supposed to use a football defensive metaphor here as that’s my theme, but I can’t resist this thought… Football teams work on their efficiency by running the “two minute drill”, by keeping the offensive plays simple and designing them to stop the clock after each play. A calm and collected quarterback can march his offense down the field. Zip. Zip. Zip. Score. The next time you watch one of these, look at the body language and attitude of the offensive players. They move with a purpose, and do things with more precision and hustle. Try doing your own two minute drill in your shop. Is this the attitude of your employees? Are they trying to score every day? If you produced a sample for the order previously, did it make it to the press for the set-up to make sure it matches? Are samples and first strike offs reviewed by a manager, an artist, or another set of eyeballs before running the job? Are there sign-offs for accountability? Keeping and organizing your production samples will defend against running the job incorrectly. Make sure you have a good system. Quality starts with the first shirt produced. Will the last one in the run look the same? It should. Are you sure that’s the right color ink or thread color? It pays to double check. What about the inventory counts and shirt colors? Is someone at the machine reviewing the work order to make sure you have everything you need before you start the job? Having a procedure to stop and examine what you are supposed to do BEFORE the work starts on the next order is always a great place to start. Have your crew huddle up and review the job. If you asked anyone on the crew during the print run production details about the order, would they have the answer? How many pieces? When does it have to ship? Where is it going after your part of the production is over? What ink or thread color will the back use? How many inches down from the collar should the location be produced? In your shop, if a job “has to go” is everyone in the building aware of it? What about normal jobs that just have to ship on Wednesday? Can do you do this without having a special meeting? Are important jobs identified with a special sticker or job jacket? Are your team members taught how to review your system and make decisions for themselves? Here’s a thought…if you can’t do this daily without having a special morning production meeting, then you aren’t training your staff correctly. Teach them to read your playbook and be responsible for understanding it. As in football, those that can’t handle the material are cut from the team. Recruit better players. Studying game film to look for tendencies of your opponent is mandatory for defenses. That’s how those two top Quarterbacks were shut down in the Super Bowl. It’s all about being prepared. How prepared is your shop? The early effort you put into things shows up when it matters. Keeping your shop clean. Maintaining your equipment. Training your people. Working backwards from the ship date on tasks. Adding the correct notes on the Work Order. Using the best tools available for the job. All this comes to fruition when your customer hands you that hand grenade that other shops back away from. For you, it’s business as normal and you can pull it off as you’ve already put the work into it to make it happen. It’s the “P” rule…Proper Planning Prevents Poor Performance. The simple mechanical aspects of production is another defensive attitude. We all know that level platens, off-contact, tight screens, squeegee angle & pressure and correctly calibrated dryers with optimum belt speed and temperature, all make a difference in how the print comes out. For embroidery, it’s thread tension, sharp needles, good solid hooping, and the correct sewing speed that make a difference. In digital printing, it’s all about the pretreatment, but humidity, clean nozzles, and of course how you dry the shirt that are important We all know this stuff. In football terms, it’s basic blocking and tackling. But just like in football, people make mistakes and forget the basic fundamentals occasionally. Production workers can get into “zombie mode” where there brains just quit working. That’s why you have to have constant training, supervision and reinforcement of the basics. I’ve always liked the old Ronald Reagan quote – “Trust, but verify.” Trust your troops are doing it right, but check on them from time to time anyway. Even at the NFL level, coaches have their players run drills that elaborate the need to do the basic things correctly. Details matter. Another defensive posture you can adopt in your shop is to implement a sustainability program. Believe it or not, if you go beyond just recycling your soda cans you can save a lot of money in your shop. It’s all about doing things in a better way. When you think about it, sustainability and any type of manufacturing go hand in hand. We all want to do more with less. We all want improvement. We all want better quality. Why do companies want to “go green”? Green equals money. Saving a little bit here, and a little bit there adds up. Sometimes to a big duffel bag of money. All you have to do is start. Being a good teammate is also part of a good company defensive posture. We all know that in business, the unexpected happens. A rush order comes in. Machines break down. Someone calls in sick. Sometimes all of these at once. In your company, when the crucible is really hot, do your teammates crumble or do they step up and rise to the occasion? This means could mean getting out of your comfort zone. Embroidery operators have to pull shirts off a printing press. A gang of people needs to help unload a truck. Supervisors or front office people are manning the hangtag guns. Do people step with a happy attitude? Or, is there just a lot of grumbling and discontent about how “that’s not in my job description.” I’ll bet you can guess how I feel about that. Do you ever think about bench strength? Who is next in line for any job in your company? Here’s a perfect football example. Brett Favre. It was just announced that he is going into the NFL Hall of Fame for his incredible run with the Green Bay Packers. If you remember he left and retired, and came back, and left again. It was a mess. The new guy that they picked to replace him, Aaron Rodgers has worked out pretty well though. At the time, nobody thought old number four could be replaced. I’ll bet you have employees that think that way too. Who is on your bench? So the next time you are walking around your shop, think about that old Bear Bryant quote. Defense Wins Championships. There always is something that you can tweak, teach or change. Any good continuous improvement step starts with identifying the challenge. What are you doing today to improve? I read this blog every week. It’s one of the best ways I’ve used to learn and improve the processes in our shop. Thanks for all your encouragement and wisdom and most importantly SHARING it! I’m truly grateful! Next Next post: Screen-printing is a Lion. Digital Printing is a Cheetah.